Photographing secret proposals is one of our favorite things to do! When Cody reached out to us to capture his proposal to Ashley, the adventure related to the photograph seemed to impressive to pass up. 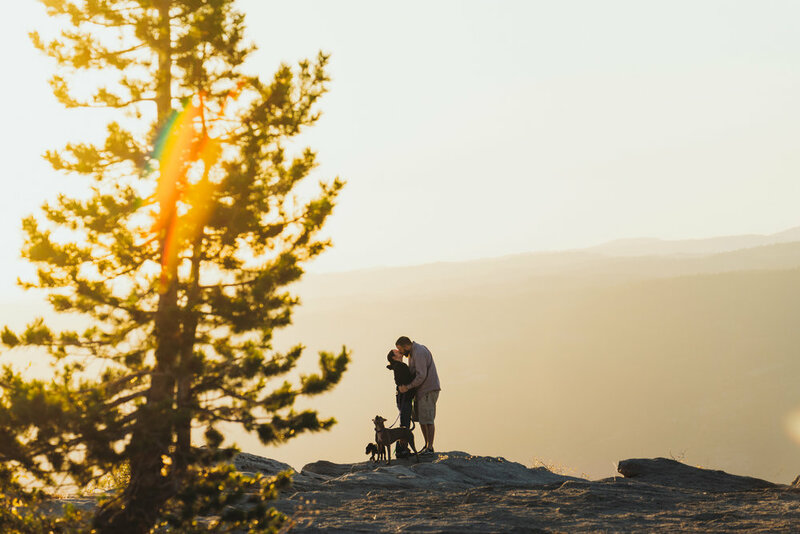 After a few weeks of careful planning, we met Cody to drive up to the 9,000ft granite overlook in the Sierra Nevada mountains above Pinecrest Lake, outside Tuolumne California. It was an exploration mission, to take a look at the spot and locate the best spot for him to propose and for us to hide without being seen. On the final day we drove up about an hour ahead of time, ditched the car in some bushes, then hid out and waited for them to arrive. Ashley of course had no idea we were there or what was to come. When the moment came we had to get the photo right the first time, these moments cannot be re-done. Thankfully with good planning and preparation we captured all of the moments when he knelled down and asked. If you’re planning a secret proposal, let us know. So far we have not yet seen a location that we can’t capture. Even mountain tops at 9,000ft, after driving 15 miles on dirt roads, at sunset. It’s amazingly fun for us!